BMS-538203 is a highly efficient HIV integrase inhibitor and antiviral agent. 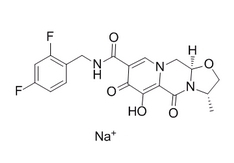 Bictegravir is a novel, potent inhibitor of HIV-1 integrase with an IC50 of 7.5 nM. Bictegravir, also known as GS-9883, is a potent, unboosted, once-Daily HIV-1 Integrase Strand Transfer Inhibitor (INSTI) (IC50 - 1.6 nM) with improved pharmacokinetics and in vitro resistance profile. Cabotegravir is a potent HIV integrase inhibitor as an oral lead-in tablet and long-acting injectable for the treatment and prevention of HIV infection. 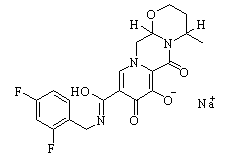 Cabotegravir is an inhibitor of OAT1 (IC50 0.81 μM) and OAT3 (IC50 0.41 μM). 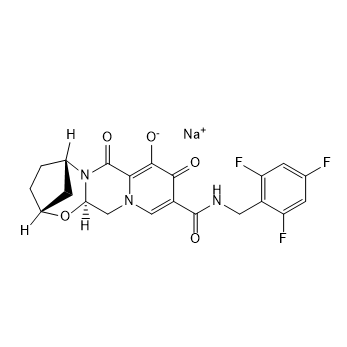 Dolutegravir sodium salt(DTG; GSK1349572) is a HIV integrase inhibitor(IC50= 2.7 nM), modest activity against raltegravir-resistant signature mutants Y143R, Q148K, N155H, and G140S/Q148H. Elvitegravir is a human immunodeficiency virus integrase inhibitor with EC50 of 0.7, 2.8 and 1.4 for HIV-1 IIIB, HIV-2 EHO and HIV-2 ROD.